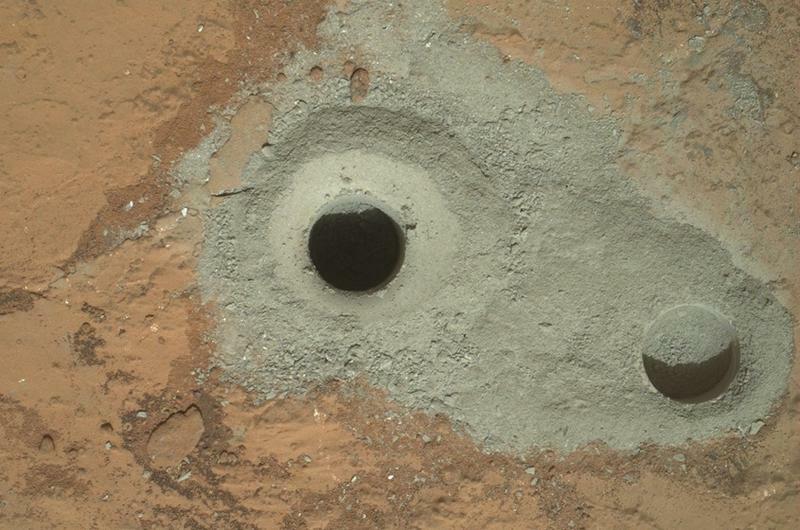 The Mars Curiosity's lifelong dream of drilling into the Red Planet's surface has finally come true. In a celebratory Tweet on Saturday, a picture reveals a freshly dug hole—about 0.63-inch wide and 2.5-inches deep—in a fine-grained sedimentary bedrock thought to contain evidence of water. This is the first time Curiosity has used the drill carried at the end of its robotic arm. "The most advanced planetary robot ever designed is now a fully operating analytical laboratory on Mars, said John Grunsfeld, NASA associate administrator for the agency's Science Mission Directorate. Curiosity's goal all along was to travel to a specific site near the Gale Crater, where it has previously turned up interesting information along the way. "We commanded the first full-depth drilling, and we believe we have collected sufficient material from the rock to meet our objectives of hardware cleaning and sample drop-off," said Avi Okon, drill cognizant engineer at NASA. NASA explained that rock powder generated during the drilling will travel through the rover's bit assembly chambers, and then transferred to the sample-handling mechanisms where sorting will take place. To actually analyze the sample, the powder will be vibrated over a sieve to filter out particles, and finally handed over to the Curiosity's Chemistry and Mineralogy instrument. "This is the biggest milestone accomplishment for the Curiosity team since the sky-crane landing last August, another proud day for America," Grunsfeld said. Curiosity previously analyzed a soil sample back in December, but this is the first time the rover has penetrated the planet's surface. Evidence has suggested there may have at one point been water on Mars—even life—so hopefully this step will help NASA further unravel the planet's mysterious history.